“Sedated Chihuahuas” – this analogy was used by probably the most illustrious investor in the world to describe the effectiveness of remuneration committees in large companies. The caustic comment raises the question of whether or not the activity of remuneration committees has improved in the last decade and thus is currently best described with reference to a “Doberman” or still as a “purse dog on valium”. The justification of a company having a remuneration committee (hereinafter “RemCo”) is simple and based on the “agency theory” whereby directors are employed to act as proxies for shareholders and manage a companies’ business on their behalf. However, their powers allow them to manage the business in a manner, which facilitates their own interests. Excessive remuneration and bonus schemes are probably the most controversial outcomes which may be considered as a result of this principle. The UK Corporate Governance Code (hereinafter “the Code”) has tried to deal with this issue, providing principles to establish an appropriate level of remuneration for directors and to align this remuneration with the interest of the shareholders. However, the salaries of CEOs of FTSE100 companies have increased significantly over the last ten years. This is supported by a recent Manifest survey which shows that FTSE100 RemCos still grant remuneration packages above the inflation rate and the average pay increase of employees. Specifically, the median increase in recent years has been around 10%, while the total average remuneration was around £4.8 million. On the other hand, the salaries of employees in FTSE100 companies have increased by only 1% on average. Remarkably even RemCo members consider the remuneration of CEOs in FTSE100 companies as to be too high. According to a Hay Group survey “nearly 75% of those surveyed felt pay was too high and almost 90% regarded the link between remuneration and performance as 'broken'”. As the level of remuneration has increased considerably in recent years, it is indeed questionable whether multi-million salaries for directors can be justified when taking into account economic or fairness reasons and whether RemCos undertake their responsibilities properly. As well as providing the theoretical and legal background and the rationale behind the establishment of RemCos Section 1 of this essay questions the level of remuneration and assesses, whether it can be justified on economic or fairness grounds. Whereas Section 2 shows that the RemCos are not solely responsible for the ratcheting up of executive payments since external factors such as pay consultants influence the remuneration design. The essay demonstrates that the current way RemCos undertake their responsibilities raise major concerns and leaves room for improvement. Section 3 evaluates the recent reforms, such as enhanced disclosure requirements related to the role of remuneration consultants and suggests that these reforms are the first step in the right direction to re-balance executive remuneration but will also show that the execution of these reforms can be considered as rather poor and will have little effect. The essay concludes finally that remuneration committees are only partly responsible for increasing remuneration levels and that further reforms are still necessary. The rationale for the existence of RemCos is based on theories that describe executives’ payments as part of the corporate governance of a company. Accordingly, the following section briefly considers the dominant underlying agency theory. As a consequence of the wide-ranging discretion of directors, conflicts of interest may arise in various situations. Secondly a conflict of interest arises, in relation to the differentiating objectives of directors and shareholders regarding the returns of the company. While the latter are commonly interested in a quick return on investment, directors frequently want to keep the company’s earnings. In brief, the common bases to finance the growth of a company are retained earnings or debt. However, the use of debt, is not as not favourable for the management as the financing with retained earnings because it is accompanied by with an increased monitoring. In case a credit is granted to a company the respective lender may reduce the discretion of the management commonly by using either debt covenants or by imposing enhanced monitoring on the management in order to protect his investment. Moreover, as the growth of a company increases so usually does the standing of the director, since it comes with greater resources under management. Retained earnings are therefore favourable for directors as it allows them to avoid constraints related to their discretion and strengthens their position in the company. Cited by Whitney Tilson, ‘Meeting notes (Tilson Fund)’ (May 2004) http://warrenbuffettresource.wordpress.com/letters/letters-to-shareholders/shareholders- meeting-notes/_accessed 25 April 2014; as cited in: Martin J Conyon, ‘Compensation committees and CEO pay’ in Christine A Mallin, Handbook on International Corporate Governance: Country Analyses (EEP 2011), 297. FRC, ‘The UK Corporate Governance Code‘ (September 2012). 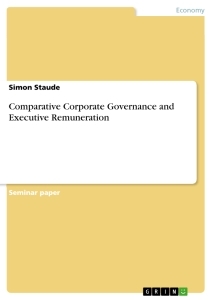 BIS, ‘Executive Remuneration - Discussion paper: summary of responses’ (January 2012), 4 <http://www.gov.uk/government/uploads/system/uploads/attachment_data/file/31381/12-564- executive-remuneration-discussion-paper-summary-responses.pdf>_accessed 21 April 2014 (BIS Discussion paper). Manifest, ‘The Manifest/MM&K Executive Director Total Remuneration Survey for 2012’ (2012) <http://blog.manifest.co.uk/2012/06/5739.html#_ftn3>_accessed 21 April 2014. The Telegraph, ‘FTSE remuneration chiefs believe pay is too high’ (29 Jul 2012) http://www.telegraph.co.uk/finance/newsbysector/industry/9436007/FTSE-remuneration-chiefs- believe-pay-is-too-high-survey.html>_accessed 21 April 2014. Lucian A Bebchuk and Jesse M Fried, ‘Executive compensation as an agency problem’ (2003), Harvard Law School Discussion Paper No. 421, 1 (‘Bebchuck and Fried 2003’) <http://papers.ssrn.com/abstract_id=364220>_accessed 21 April 2014. Adolf A Berle and Gardiner C Means, The Modern Corporation and Private Property, Macmillan, 1932. Michael C Jensen and William H Meckling, ‘Theory of the Firm: Managerial Behaviour, Agency Costs, and Ownership Structure’ (1976) 3 Journal of Financial Economics 305, 308 (‘Jensen and Mecking 1976’). Bengt Holmstrom, ‘Managerial incentive problems: a dynamic perspective’ (1979) 226 Review of Economic Studies 169, 169. Jensen and Mecking 1976 (n13) 308. OECD Glossary of Statistical Terms <http://stats.oecd.org/glossary/detail.asp?ID=1689> accessed 21 April 2014. Demetra Arsalidou, ‘The Regulation of Executive Pay and Economic Theory’ (2011) 5 Journal of Business Law 431, 436.
 ibid (n15) 226; Ian Gregory-Smith, ‘Chief Executive Pay and Remuneration Committee Independence’ (2012) 74(4) Oxford Bulletin Of Economics and Statistics 510, 512. Michael C Jensen, ‘Agency Costs of Free Cash Flow, Corporate Finance and Takeovers’ (1986) 76 American Economic Review 323, 324 (‘Jensen 1986’). Frank H Easterbrook, ‘Two Agency-Cost Explanations of Dividends’ (1984) 74 American Economic Review 650, 653. Patrick McColgan, 'Agency Theory and Corporate Governance: a Review of the Literature from a UK Perspective' (May 2001) University of Strathclyde Working Paper, 11 <http://www.ppge.ufrgs.br/giacomo/arquivos/gov-corp/mccolgan-2001.pdf>_accessed 21 April 2014.